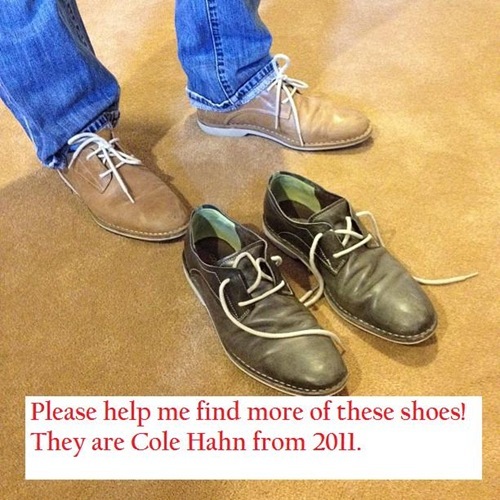 If you work at Cole Hahn, if you know someone who works at Cole Hahn or if you’ve waved hello to an elderly lady who has a child who works at Cole Hahn I need your help. My husband has the perfect shoes. He has two pair of them in different colors and they’re nearing the end of their lifespan. We Gottliebs are now facing a crisis. No matter how many pair of beautiful shoes I bring home for him Mr. G refuses to wear anything but these. If ever there was an emergency this is it. Update: Y’all are amazing. They’ve been identified as the Oswego and we’re looking for size 10. There is another shoe that’s also called the Oswego it has red laces and a brown sole we are NOT looking for that one. We need the white soled Oswego. Now that is a serious shoe emergency! I’ve had favorite shoes like that…they’re almost like a part of your feet! Good luck! No luck finding that color, sorry! What an emergency, LOL! Which size are those shoes ? Would you also pay shipping from overseas ? @19177c4ed3f57023e468d42b9e933f1a:disqus – I totally disagree with you, you’re absolutely insensitive it seems. if you buy the last size 10’s I’ll be coming after you.